I have a real crush for colored tights or socks worn with shoes, it adds such a unique and original touch to any outfit. These are some of my favorites as I was trying on some different styles at home the other day. Which of these would you dare? From yesterday I'm at my hometown, spending the Easter holidays with my family - between huge meals and serious amounts of chocolate everything can look better, even the excessive calm of my small town. Hope you enjoy your holidays too loves! Από χθες είμαι στην πόλη μου για τις διακοπές του Πάσχα - ανάμεσα σε τεράστια γεύματα και σοβαρές ποσότητες σοκολάτας όλα μπορούν να δείχνουν καλύτερα, ακόμα και η υπερβολική ηρεμία της μικρής μου πόλης. Ελπίζω να απολαμβάνετε και εσείς τις διακοπές σας καλοί μου! totally adorable!! !luv all of them!!!! Gia na pw tin alitheia akoma den exw tolmisei auto to trend, giati den nomizw oti tha mou paei! Alla esi to ipostirizeis poli kala! Love it! The socks are so cute! 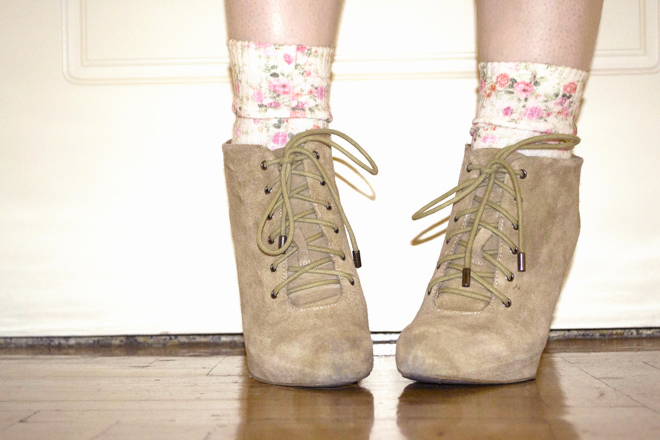 the last one with the floral tights is so so cute!!! I'd love to see your place too rania! especially your bedroom! I love the pictures and your red hair!! !